Mx One Antivirus is a basic anti-virus tool that can be installed either on your computer or right on your USB stick, or portable multimedia device. If you choose the first option, Mx One Antivirus will protect your system from infected USB devices, and if you choose the second one the program will be installed on the USB device itself, thus enabling you to have an anti-virus solution with you at all times. Mx One Antivirus lets you scan any drive or folder on your system – or on the USB drive as well. Whenever it detects an infected file, you can choose to either delete it or send it to quarantine. 1.Install and protect your whole computer with realtime protection from worms and viruses. 2.Integrate a portable .exe file into your usb device such as Mp3 player, iPod, Memory stick and save it from threats and when you execute that .exe file it do a couple of security jobs for you such as scanning and cleaning and quarantining infected files on your usb device. software update to your usb drive is also possible. Mx One Antivirus provides you with a basic protection tool you can use on any computer, anywhere, anytime. The other good feature is its light weight and consumes less system resources if you install realtime protection and user interface is easily understandable so novices should’t have any problem using MXone. Despite being quite a basic anti-virus tool, Mx One Antivirus is a handy security tool you can carry with you at all times in your USB device. Mx One Antivirus - Antivirus USB, Pendrive, USB , Mp3, Mp4, iPod, etc. 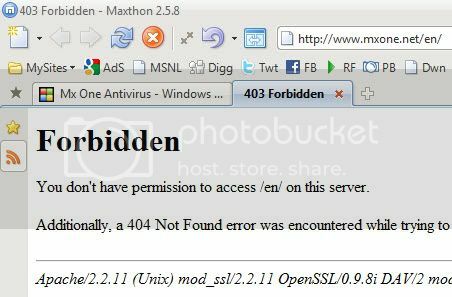 Link gives : Forbidden Error. I tried the link today, it works and I downloaded the file again. tried the link works ok. I think this could be quite a handy little thing to carry with you on a usb, but not one to use otherwise. Strange - I still get that error.